Update: 2/23/06 "The cockatiel formerly known as "Bonnie" is doing great! We have renamed her Milly for her love of millet. We have been successful in training her to be hand friendly with the bribe of millet. She is very comfortable in her cage and plays with the toys we have gotten her. She often climbs down to the coffee table we have close to her cage and has a walk around and, if she fancies it, flies to one of us on the couch. She is ready to come to us on her own terms, but she has come a long way from November when she came to us as a frightened, shaky bird who totally avoided any contact with us. She eats pellets willingly, and we cut up fruit and sprouts for her every morning and mix them with a bit of seed. I have recently tried her on avicakes which she loves. There is screeching every morning until her breakfast is ready, and I think that is a great sign! She hasn`t taken to bathing, so I resort to spritzing her with a spray bottle, but she still doesn`t like that. We have done day-long car trip with her and she did well, although I was nearly deaf from her screeching in such close quarters! We are happy with her and believe she is happy with us and together we?ll have a long relationship." Aren`t I a Bonnie lass? 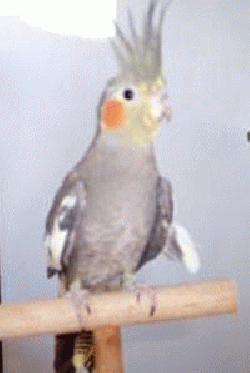 I`m a cockatiel who was purchased as a companion for another bird, who sadly then died. I wasn`t wanted anymore, so I ended up at Mickaboo. Fortunately, there was a visit to the vet first, because I had an infection and was about to lay an egg. Now, I have a clean bill of health. I enjoy the company of other birds but am also learning to enjoy people, though I wasn`t handled much in the past. I am not a biter and will make a wonderful companion in return for receiving a lot of attention.